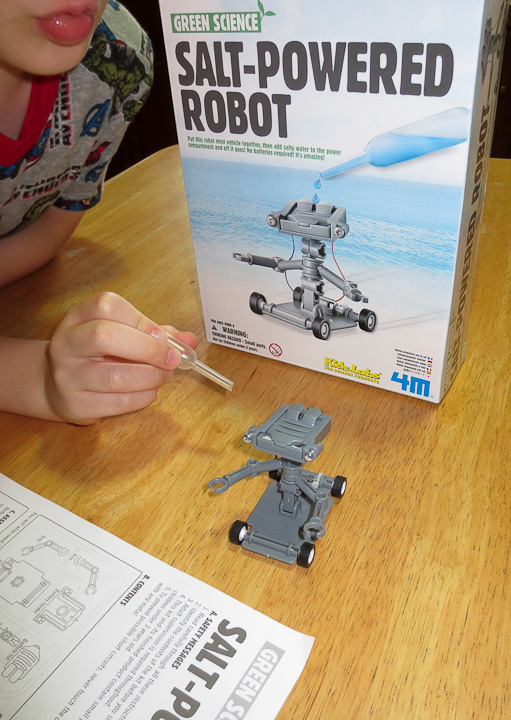 I love the modern prevalence of robot kits available for children to build. 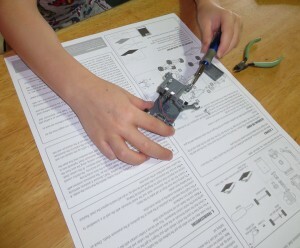 They have many different types of kits available for different age groups. 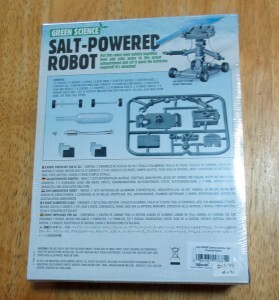 My nephew visited me a while back and I had picked up a The Salt Powered Robot Kit for us to build together. 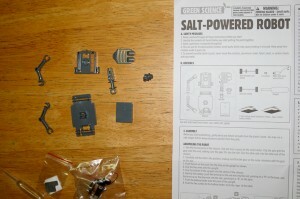 This post shows the build process, which he did almost entirely himself. 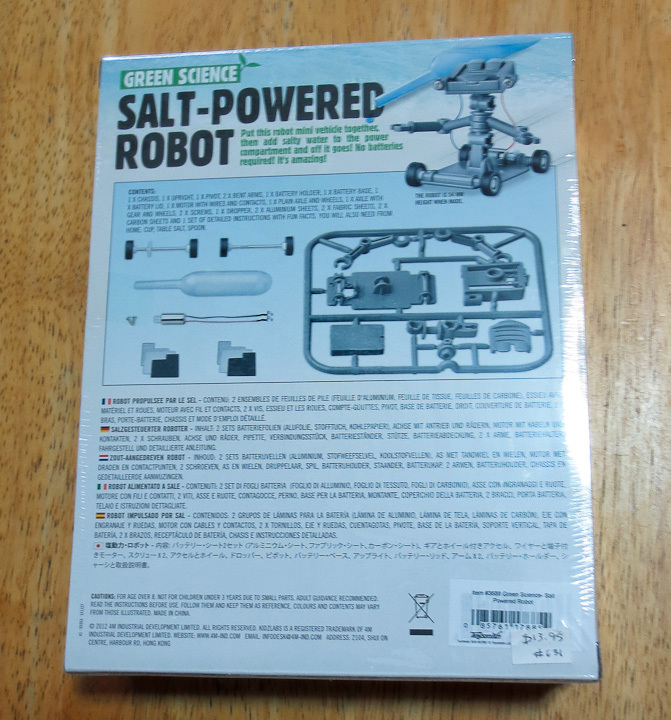 This Salt Powered Robot Kit is made by 4M as part of their Green Science line, and comes in a nicely illustrated box. 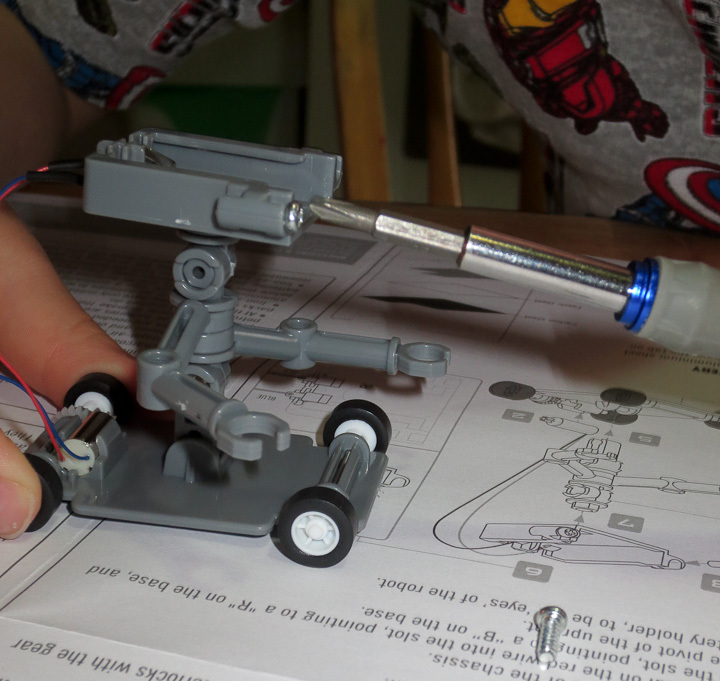 My Nephew was super excited when he saw that I had a robot project for him during his visit. In the past we had great fun building a Tin can robot kit. With this kit I let my nephew do all the work, while I offered guidance and took photos. Taking the parts out of the box, we quickly realized it could have been in a much smaller box. 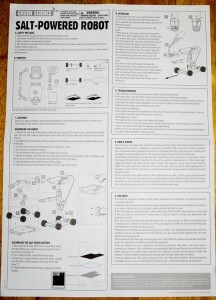 Just one small bag of parts and some detailed instructions. 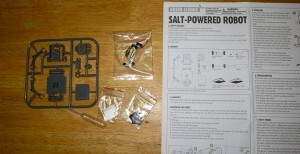 Expanding the photos above will allow you to read the instruction sheet for the Salt Powered Robot. In case someone needs them in the future. 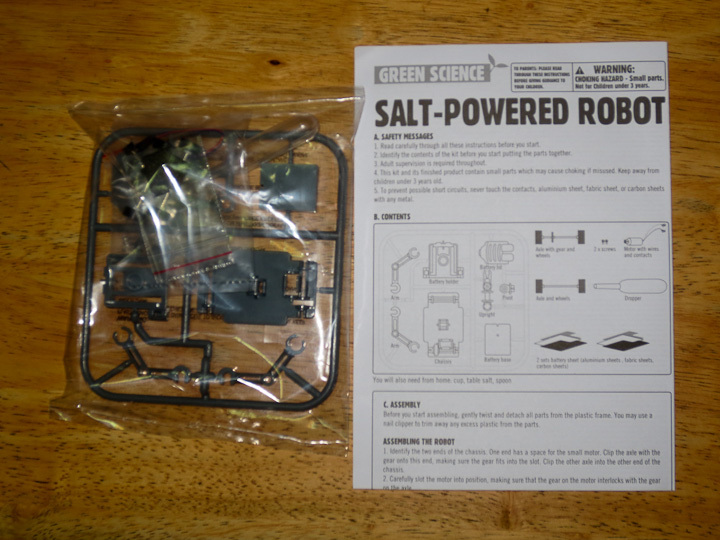 The single sprue of plastic parts is laid out and the other bags contain the small parts needed to make this robot go, a motor, screws, cathode and anode plates and a separator. 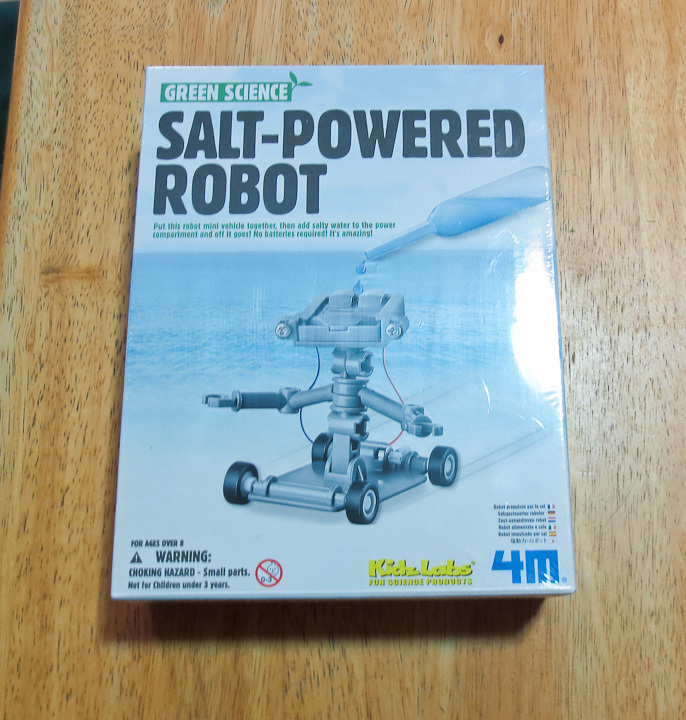 You have to supply your own salt and water. 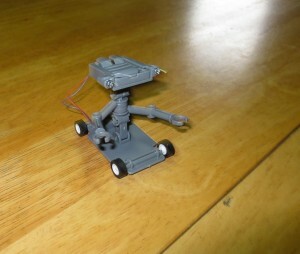 I’m pretty proud my lil Nephew managed this robot build all by himself. 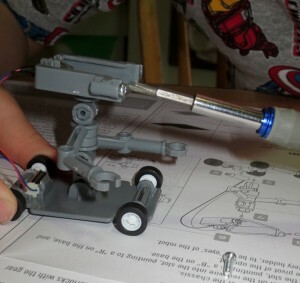 At the age of 6 years old, he did (almost) everything to build this kit by himself, . 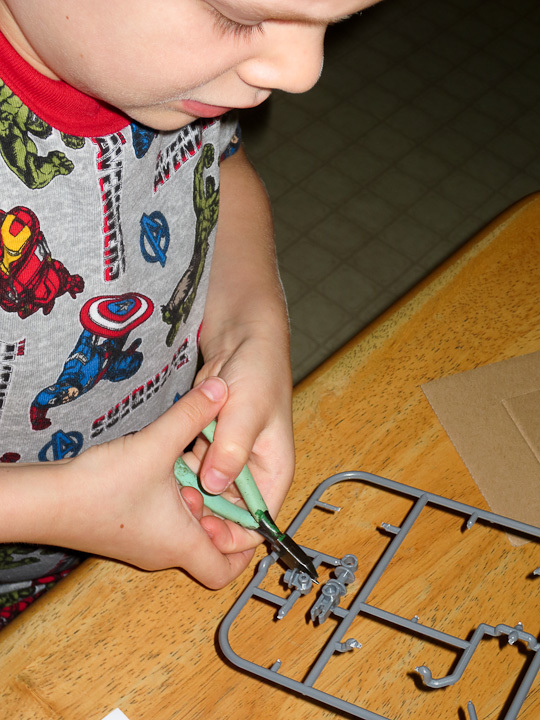 We spread out the parts after cutting them from the sprue. 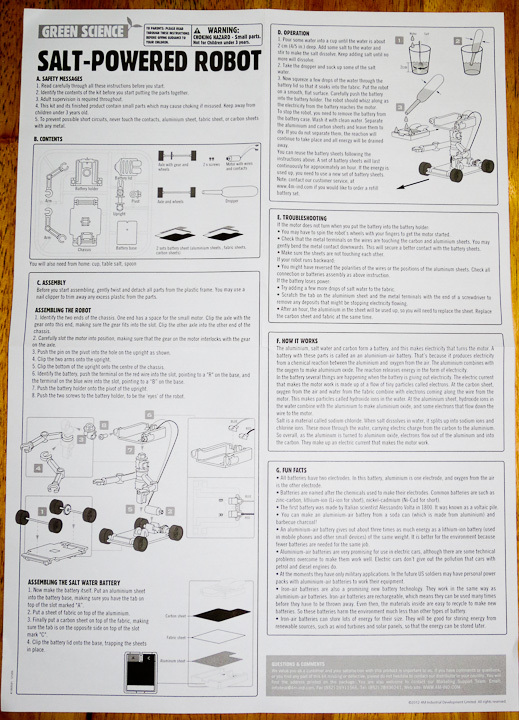 Assembly following the instructions was quite straight forward. 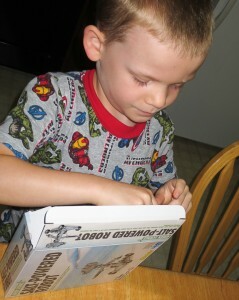 My little nephew could read and follow the instructions easily. 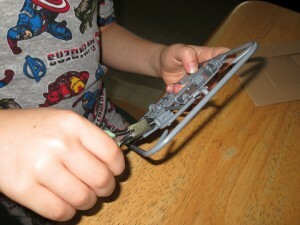 The one part that he was not able to do himself was snapping the two axles into place. He was not strong enough for this part. Even when he put his entire weight on them they refused to snap in place. 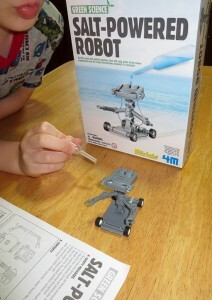 My only contribution to this robots construction was that I helped install the two axle pieces. There were a few small screws which he managed to put in entirely on his own with a small screwdriver. 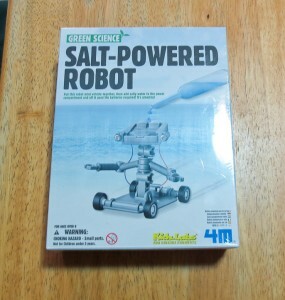 This was a fun kit to build. 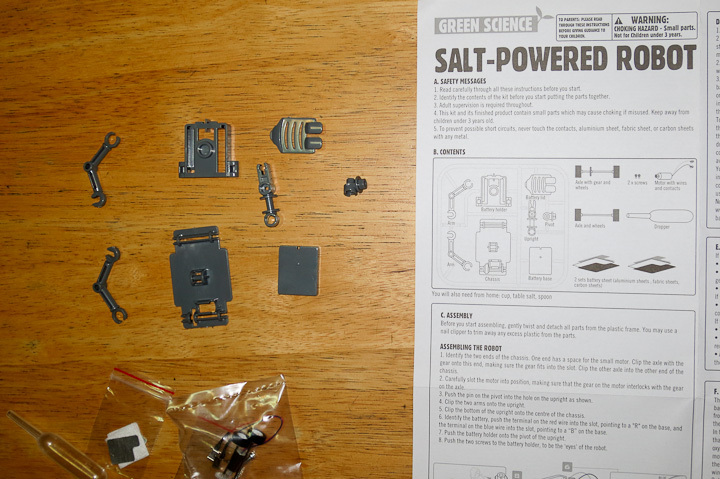 You have to mix up salt water, I used a shot glass and a tablespoon of salt into warm water. The instructions call for a saturated solution, meaning you have solid salt remaining after stirring so the water has as much salt dissolved in it as possible. The two plates used to make the “battery” that powers the motor last for some time. The robot went for some 10-15 minutes. The above video link shows the robot kit in action. 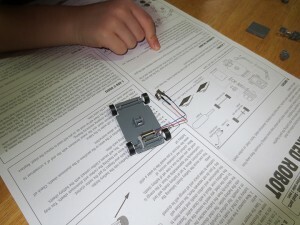 This robot kit and many others are great fun for children. Next time you need a gift for a little girl or boy, consider an educational kit like this over another stuffed animal, doll, car, or action figure.